Today’s guest, joining us today on the Join Up Dots entrepreneur podcast interview is a man who has dived deep into the world of sharks. 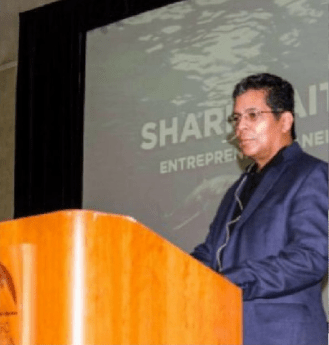 He is the owner of The Sharks & Stripes Conference & Expo which is for military entrepreneurs, veteran owned businesses and private sector entrepreneurs/small business owners. This is a conference that features the powerful entrepreneur panel presentation featuring some of the most successful Shark Tank entrepreneurs and focuses on helping those in our Armed Forces who have the entrepreneurial spirit. He aims to help those leaving the military transition into a new world of entrepreneurial ventures. However behind the scenes our guest has been battling a very different kind of challenge. Back in 2005 our guest was very ill indeed, after being diagnosed with a disease which there is NO CURE! As he says “I have a great story of how I did this on the brink of bankruptcy and through immense pain and sickness from the powerful drugs and therapy I was enduring when diagnosed. So what was his life like before this rude awakening…floating through like most of us or as focused and determined as he is now? We discuss why it is such a powerful method to tap into a business that already has an audience interested in that subject. You can shave years of your progress. Why Americans love to show the success and in fact celebrate success in a far greater degree than the Europeans. Rey talks about the dark times in his life, when his illness took hold of him and why this is so similar to the entrepreneurial journey. Rey shares why it is so important to delay gratification to truly be able to understand and accept the reward for what it is.